As the Education with Industry (EWI) fellow with La Quinta this year, one of my company projects is working with their veteran initiatives program. La Quinta partners with multiple non-profit organizations, including the U.S. Chamber of Commerce Hiring Our Heroes program, to employ veterans and military spouses. Many of these partnerships began when La Quinta was owned by Blackstone, a private equity firm. Every year, Blackstone organizes a Veterans Initiative Summit where many companies in their portfolio, and even outside their portfolio, attend to learn the best practices in setting up veteran initiatives in a company and to network with other companies that have been successful in this arena. This year, the event was held in Washington D.C. at the U.S. Chamber of Commerce building. 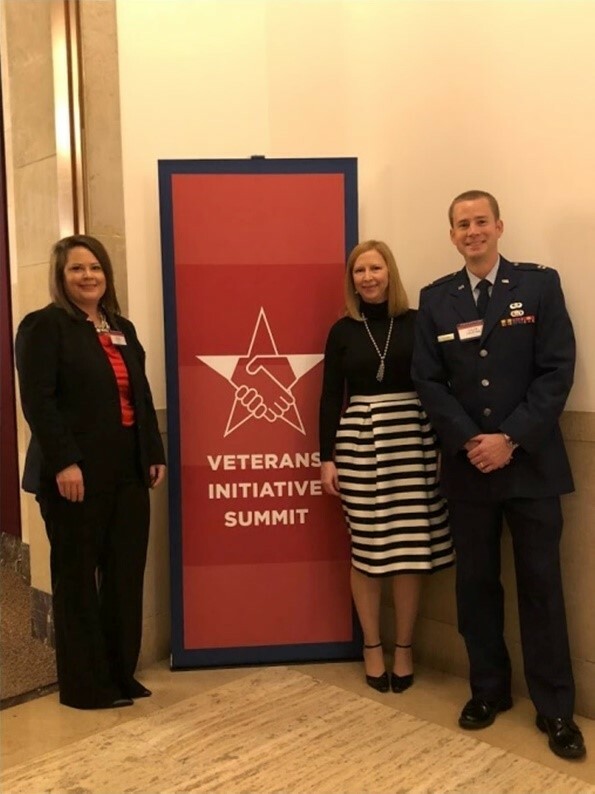 During this summit, the companies explored and discussed multiple topics including expectations and misconceptions of military-civilian transition, setting up an effective veterans initiative, partners and programs, resume and interviewing tips, among other topics. Additionally, Lieutenant General John Jansen, Deputy Commandant for Programs and Resources, from the United States Marine Corps provided a keynote address to the attendees regarding the role of companies in the current military environment. 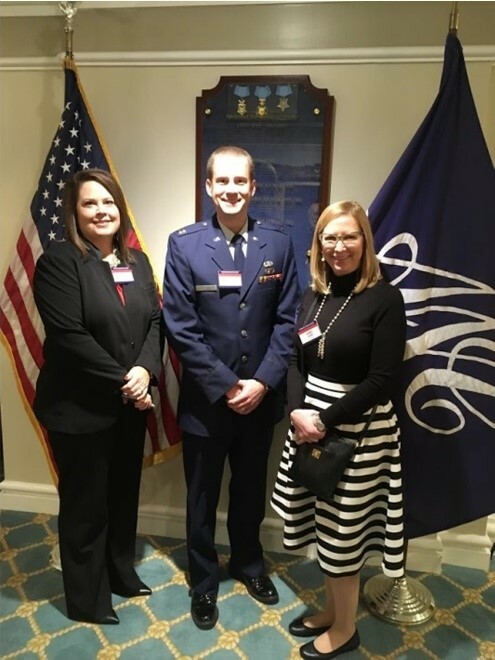 Attending the event with Liesl Vargas, Vice President of Talent Acquisition at Wyndham Hotels & Resorts (WH&R), and Aimee Lane, Manager of Talent Acquisition for WH&R, we were able to gain valuable insight in setting up veterans initiatives in a company. La Quinta was very successful in establishing veterans and military spouse partnerships, as shown by their #10 rating by Military Friendly®. But now that WH&R has acquired La Quinta, they’re in the process of setting up veterans and military spouse initiatives across the new organization. Even though, as an EWI student with La Quinta, I have been provided countless opportunities to be mentored by some of the top industry and military leaders, I was able to pass it on and mentor some cadets from the United States Military Academy. We discussed topics related to professional development, the importance of networking, leadership in the military and broadening opportunities in the military. 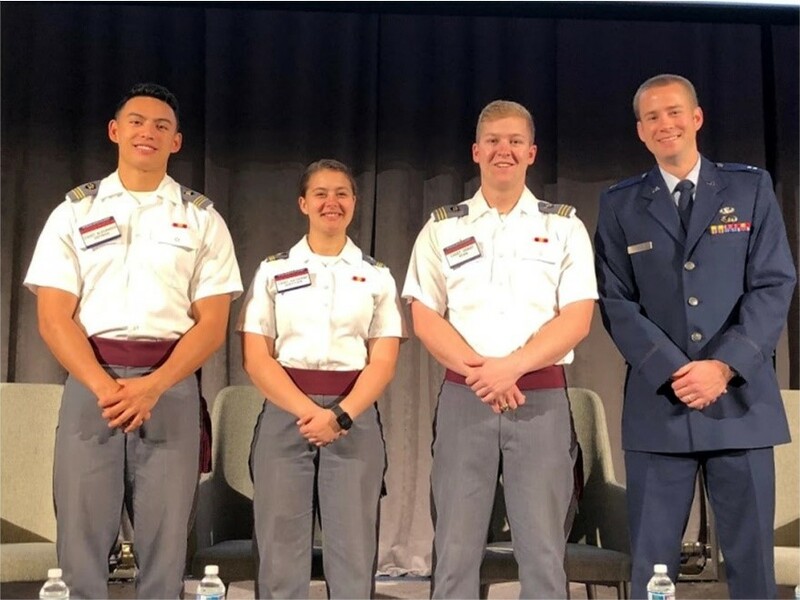 These West Point cadets joined the Veterans Initiative Summit as part of a community outreach program. Blackstone partnered with O’Melveny, Apollo, FedEx, and KKR to lead a hands-on service project during the event, called “Mission Backpack: Afghanistan.” During this project, we were able to fill 1,000 backpacks with school supplies for children in Afghanistan. These backpacks will be handed out by U.S. Military troops to Afghan children, helping bridge the gap between military and community. Additionally, these backpacks filled with school supplies are coveted because in the Afghan environment, if a child does not have their own school supplies, they’re not allowed to attend school. 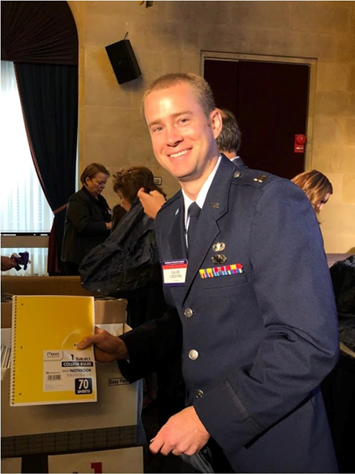 We traveled to the Army Navy Club to attend a breakout session to hear from the Director of Soldier for Life program, which improves Soldier, Family, and Army readiness by developing a broad network of resources to support every Soldier, Veteran and Family member through all phases of their service. Additionally, we heard from Ryan Siler, former U.S. Marine and Post Traumatic Stress Disorder (PTSD) and Traumatic Brain Injury (TBI) survivor. Even though PTSD and TBI are serious invisible wounds, they are mental health issues that can be managed through proper support and care. Siler was a prime example of someone who could be extremely value added to a company, even though he is managing PTSD and TBI, showing that companies should not be afraid to hire such veterans. Lastly, we visited the Eisenhower Executive Office Building (EEOB) on the White House grounds to attend a briefing on veteran initiatives. The briefing showcased the administration’s commitment to supporting military spouses, outlining the executive order signed on May 9, 2018, Enhancing Opportunity For Our Nation’s Military Families. This executive order promotes the hiring of military spouses in federal agencies. 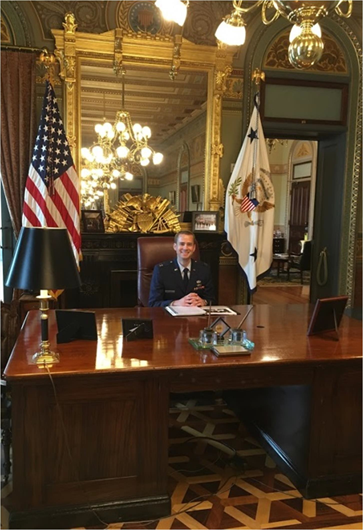 Also, Aimee Lane, WH&R Manager of Talent Acquisition, through a previous connection with Mike Pence’s assistant, took me to the Vice President’s office which we were able to tour. We also met MAJ Mike Harrison, U.S. Army, who is currently serving in the White House Fellowship program. Harrison gave us a personalized tour of the EEOB and the grounds of the White House. It was an amazing experience to walk the grounds where so much history has been made. 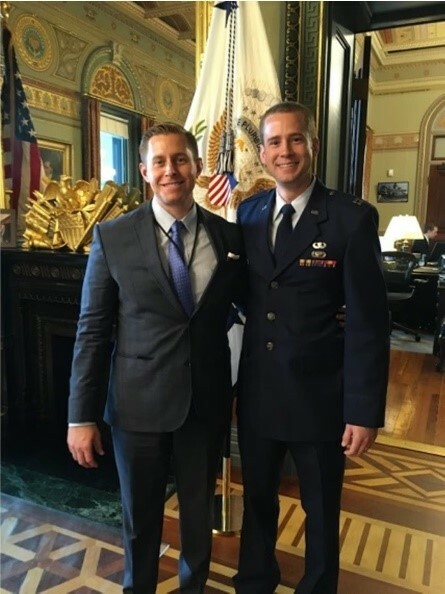 Not only was this trip beneficial in helping set up veteran initiatives within WH&R, but it was also a great networking opportunity to connect with some of the industry leaders in veteran and military spouse initiatives and meet some of the nation’s brightest young officers, including MAJ Harrison, White House fellow. 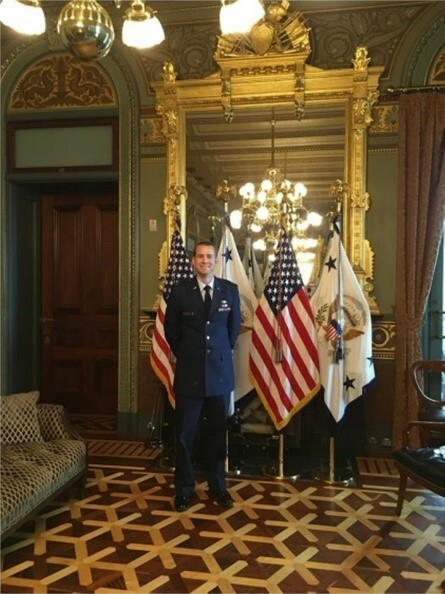 Representing WH&R, the Air Force, and the Air Force Institute of Technology’s EWI program has provided me great opportunities to development my soft skills including interpersonal communications with industry and military leaders and networking skills. These soft skills will make me a better asset to the Air Force upon completion of the EWI program.